Le film « Touba » révèle un autre visage de l’Islam en suivant le pélerinage annuel de Musulmans soufis, dans la ville sénégalaise de Touba (fondée par Cheikh Ahmadou Bamba Mbacké). « Touba » is the new feature documentary from rising talent Chai Vasarhelyi (« Youssou N’Dour : I Bring What I Love »). With unprecedented access, « Touba » reveals a different face of Islam, one which is so essential to these divisive times. 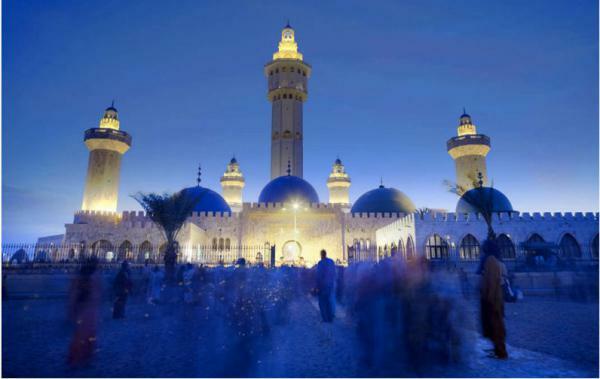 The film chronicles the annual Grand Magaal pilgrimage of one million Sufi Muslims to the holy Senegalese city of Touba. One of the rare films still shot on celluloid film, its breathtakingly vivid cinematography and integrated soundtrack elevates it to the level of a humanist film poem. This dynamic and immersive observational film takes us inside the Mouride Brotherhood-one of West Africa’s most elusive organizations and one of the world’s largest Sufi communities. The pilgrims travel from all over the world to pay homage to the life and teachings of Cheikh Amadou Bamba. His non-violent resistance to the French colonial persecution of Muslims in the late 19th century inspired a national movement and doctrine. Until this day, freedom of religious expression through pacifism is still practiced by millions of his followers. In light of what’s been happening recently in Mali and the region, these are lessons the world can learn. « Touba », filma bu ñu jaglel Magal lu Tuuba la, ci Senegaal. Daf ñuy won, ci anam yu leer, benen kanaam mu lislaam, bu ñu bare xamul. « Touba, » filma bu bees bu am solo la ci bëtu ki ko def, muy ku jigeen ku xareñ, ku ñi tàmbaale raññe bu baax ci mbirum senemaa. Mi ngi tudde Chai Vasarhelyi (moom moo def filma bi tudd: « Youssou N’Dour: I Bring What I Love »). Touba day wone, ci anaam yu ñu mësul la gis, Magal lu Tuuba bi nga xam ne milliyoŋ ak lu topp ci ay taalibe Murid di na ñu fa teew. Muy lu am solo ci jamano yi ñu toll, ak reeroo bi am ci adduna bi. Te tamit, Touba, filma bu ñu def ci anam bi ñu tudde celluloid la, muy loo xam ni neexa tul la gis fii ñu toll. Ci anam yu dooy waar ak yu dow yaram ci lay filma bi di wone Magal gi, ni mu tëddee; nit ñi fii teew; séni yëngu-yëngu; séni kàddu; ak séni jëf. Muy loo xam ni dafay yëkkati daraja filma bi, ba ñu mën ko méngëlé ak taalif buy sargal jëriñ; solo; ak maggaay yu doomu aadama. « Touba, » filma bu ñakka soof fa la, bu bari yëngu-yëngu. Daf ñu yobu fu sori, ba ci biru yoonu Murid-mu nekk yoonu diinee bu mettee xam, te bokk tamit ci tariixa yi gëna rëy ak yi gëna am solo ci adduna bi. Taalibe Muriid yi fune la ñi jogé ci adduna bi ngir siyaare ak fattaliku jëfu ak njàggalem Cheikh Amadou Bamba. Bañ gi mu bañ ci kanam mu Tubaab yi doon xoqatal ak noot julit yi, ci at yi mujj ci jamanoo yi mu ganee adduna, ak jamm ji mu ko doon jëfé, ak diglé yi mu doon diglé, loolu léepp daa fa mujj jur, ci askan wi, gëm-gëm ak am yoon nu fippu ak bañ ngir sargal reew mi. Ba fii ñu tollu, milliyoŋ ci ay taalibeem ñi ngi topp yoon boobu, gëm li ñu gëm, nu mu lèen neexe, te di ko def ci jamm ak salaam. Loolu, bu ñu xoole ci li xéew fee ci Mali, ak ci dëkk yi ñu wër, xel man na nangu ni xalaat bu rafet la, bu adduna bi yëpp wara jangat, te sakku ci ay xalaat ak jëf yu rafet.